One of the primary goals of christianretirement.com is to inspire people to find solutions to their retirement issues. How would you like to help other people? Retirement-friendly resources that have been valuable to you may help other people as well. Send your favorite retirement resources. It could be a favorite website, book, ministry, retirement organization, retirement community, organization, investment firm, or about anything else you have found to be a valuable resource. Send your favorite retirement oriented links...we will evaluate them and post those we feel would be appropriate and helpful to others. To guard your privacy, christianretierment.com will not use your name or email address when we post these ideas on our blog. If you would like credit for your post, we can use your first name or the first part of your email address without identifying your ISP. Please let us know whether you wish to be partially identified. 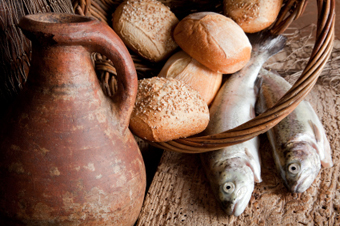 Back to the account from Mark 6 and the boy with the small lunch…when the lad left home with his meager lunch that morning to go and see Jesus, he had no idea that Jesus would use his lunch to feed several thousand people. Jesus took that which was small and insignificant and turned it into something that became significant to thousands of hungry people who witnessed one of Jesus’ many miracles. We serve a big God. We hope you have a big view of God. Want expand your view of God? Ask him to expand your view and then do something about it…read one chapter of the Gospel of John each day for 21 days. Before you read each day, ask God to bless you and to help you grow in your understanding of him, to grow to love Jesus, and to gain a God-sized view of who God is.